What is Something Cooked En Croute? In the culinary arts, the term en croute (pronounced "on KROOT") indicates a food that has been wrapped in pastry dough and then baked in the oven. The dough can be an ordinary pie dough or puff pastry. And the item can be baked in a dish or simply rolled up in pastry and baked on a rack. In other words, when you hear something en croute, what it basically means is it's a pot pie of some kind. 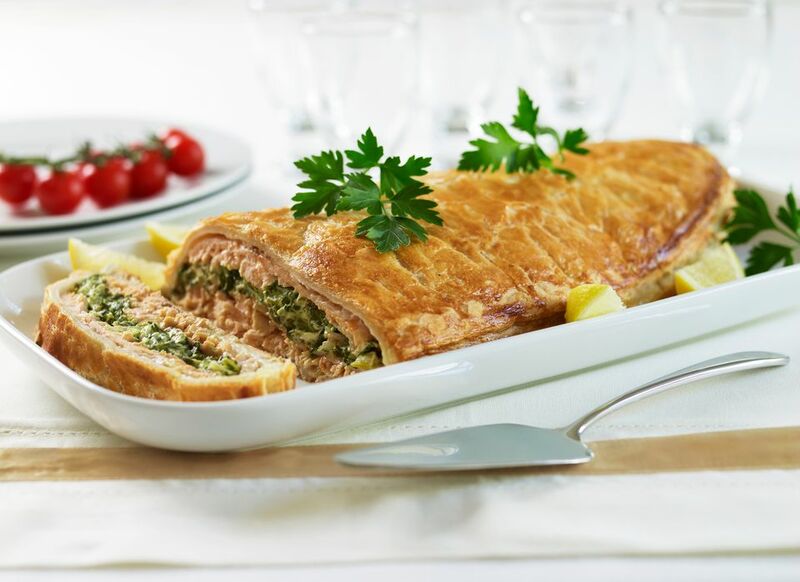 One of the most popular preparations is saumon en croute or salmon baked in pastry, and there are several traditional variations. Typically they'd be built in layers, starting with a layer of pastry, then a forcemeat of some other type of fish, such as pike, and then salmon, truffles, another layer of forcemeat and so on, before sealing with another layer of pastry on top. It's necessary to cut a hole in the top pastry to let the steam vent out while cooking. One of the classic en croute recipes is Beef Wellington, or in French, boeuf en croute. This is not quite a pot pie but rather a whole beef tenderloin which is seared and then wrapped in pastry dough along with foie gras, thinly sliced cured ham, and a paste made of chopped mushrooms and flavored with brandy. Traditionally, the type of pastry used is a simple straight pastry dough called pâte à pâté, or pâté pastry. But today, puff pastry is frequently used for most en croute recipes. The difference is that puff pastry, which is made by repeatedly folding and rolling pastry dough to create hundreds of layers, will puff up when cooked and become flaky, whereas straight pastry will remain fairly flat.